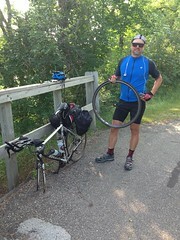 Day 28 | Fargo-Sauk Centre | captain-nicholls | Le Tour de U.S.
Woke early and took in the contie breakfast. Back to the room and we were ready to go by 7:30. Francois walked us to the lobby door and we said goodbye. A bit sad. 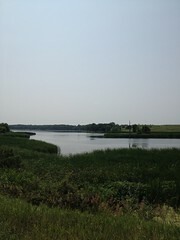 Carl directed us out of the city and we found Hwy 52 which was a great side road. We rode 103 kms to Furgus Falls and grabbed a bite. 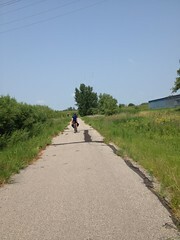 We decided that we would ride to Sauk Centre so we got back on the road. 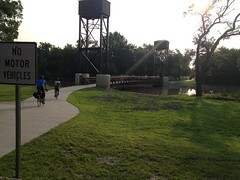 leaving Fergus Falls we were directed to a bike path by Google. 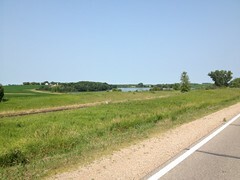 At first we thought it might last a couple kms then merge with a back road but this bike path goes all the way to Minneapolis. 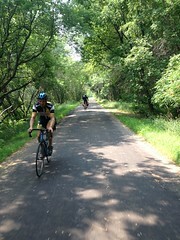 Its an old rail line that has been paved and is incredible as there is little elevation and it is nice and smooth. Trevor and Carl still managed to get flats but it was a very nice ride. 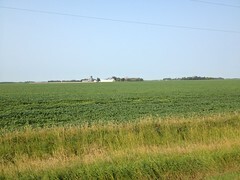 We plan on riding the remainder of it to Minneapolis tomorrow. 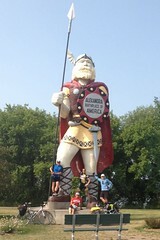 We met a few people today on the ride. One being June, who was taking her 4 grand kids fishing. Nice lady. The other person of note was Daniel, who is from Australia. He quit his job as a physiotherapist to do this trip. 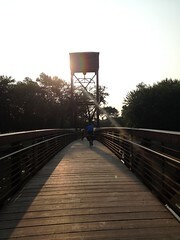 He is riding from Portland to NYC and then he is heading to Europe for more riding. 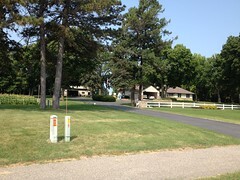 We ended up riding 223 kms today and we were very happy to find our dive motel. We grabbed Subway on the way there so we wouldn't have to leave after showering. relaxation time. One of Carls many flats today. We met June at a gas station. She was taking her 4 grand kids fishing. She was very interested in our trip. 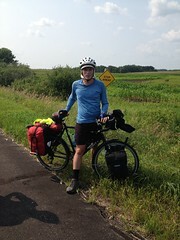 Daniel is from Australia and is riding from Portland to NYC. 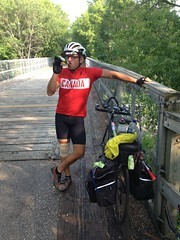 He quit his job as a physiotherapist to do the journey and is going to ride in Europe after the US. Cool guy. Alexandria's Viking. Note Daniel's presence.